Let's take a short break from sweets and chat about dinner today. I'm constantly on the lookout for dinner recipes and ideas to try out (I tend to focus heavily on breakfast and dinner when it comes to cooking). I'd like to say it's all about finding great meals for my family but in truth, it's as much about keeping things interesting for myself, as the cook. It's invigorating to try something new, learn something, and potentially find a new family favorite or something you'd want to whip up again and again. I love simple and easy recipes because those are the ones we fall back on and rely on day-to-day. Of course, more elaborate dishes and meals certainly have its own rewards. But for the most part, the recipes that catch my eye are simple ones like this one. It's a near hands-off way to cook sausages and I ultimately ended up making two meals with it. All you have to do is place sausages (I used sweet Italian sausages) in a mixture of tomato sauce and chicken stock and let it simmer until done. No messy pan-searing of the sausages first! Check on it a couple of times to give it a stir and it'll be ready in about half an hour or so. I served the sausages, along with some of the sauce they cooked in, over grits (the quick-cooking kind that only takes a few minutes) but you could go with mashed potatoes or say, polenta. For the second act: Here's a bonus - take the leftover sauce and turn it into a quick pasta sauce for the next day! Even if you do not have any sausages leftover like I did, you could just use the extra sauce for a tasty pasta dish. If you like a somewhat creamier red sauce, add a couple spoonfuls of ricotta cheese. I didn't have ricotta on hand so I only used Parmesan cheese. It was easy and tasty. And that was two easy dinners that were well worth making! Whenever I make cupcakes, I realize why they've remained so popular. Like donuts, they are such cheerful little things! They conjure up bake sales and children's birthday parties. They're a forum for colorful sprinkles and other fun embellishments and decorations. It's a personal mini cake just for you, and you can have more than one if you want to - it's hard not to love all that! So maybe I should make cupcakes more often. Right now, I'm "auditioning" this latest batch of vanilla cupcakes with chocolate frosting for my son's birthday next month. He's turning 12! That's amazing because it seems like only yesterday when I was carrying him around in a baby carrier and tucking a blanket around him in his car seat. Now, that baby is growing more and more independent and I can almost see clues of the adult he's going to become. Everyone's birthday is special, and I think that's especially the case when it comes to kids. We're always trying to find some extra little ways to show our love, especially on their big day. For me, food is a part of that. Now, to be honest, my son would likely choose pizza and a classic store-bought ice cream cake for his day. I'm totally okay with that (those being things I love best as a kid, too)...but that doesn't stop me from making a little something extra - it might be a cake or cupcakes, something that I can put my imprint on and personalize. So while I've got a lot of things in the archives I can make already, I thought it was a good time to audition another cupcake recipe. This is a recipe from Jessica Seinfeld's new book, Food Swings; the cupcakes sounded easy to make and lovely to eat. Verdict: they passed their audition with flying colors! The vanilla cupcakes are rich in flavor, moist and tender, yet firm enough that you can eat with your hands without them falling apart. The frosting is smooth and creamy, full of chocolate flavor. I used to say I'm not a big frosting person but I've had to re-evaluate that claim because I'm not so sure it's true anymore - at least not when it comes to chocolate frosting! My son is certainly a frosting person and he was readily licking this frosting off! These cupcakes go down easy. I know I often say that about desserts I like but it's really true and the best way I can think of to describe it sometimes. So the upcoming birthday boy was a fan and so was everyone else eating it. If you have a birthday coming up and you're looking for a good cupcake recipe to make - one that's great tasting and uncomplicated, I can say these are an excellent choice. 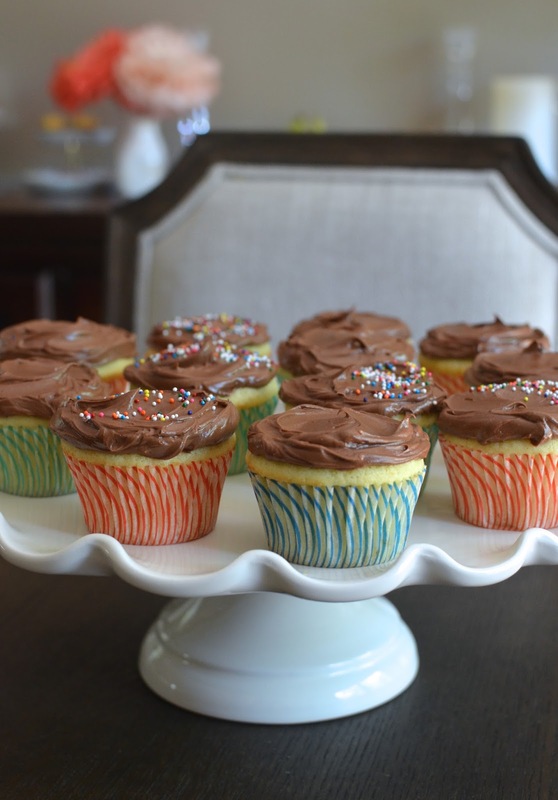 As my son was devouring the last of these cupcakes, he asked me if I'd make them again soon. You know what? He just might see them again next month! I hope you had a good Mother's Day! For us, this past weekend started with a deluge of rain all Saturday, but somehow, I had a feeling Mother's Day would turn out nice if history was any indication. Sure enough, the sun was shining most of the day...what a nice gift for us moms. I spent Mother's Day morning relaxing and enjoying breakfast in bed. It's become something of a tradition and a lovely treat. I took my time enjoying it but then I got up and started the day because I realized a while back that if I spend too much time relaxing or doing nothing, it starts driving me crazy. So I took some time savoring my breakfast, then I got up to do what I like to do best - you know cooking/baking was involved! My husband bought me some delicious raspberries; I devoured a good chunk of it at breakfast but managed to save some for a few soufflés. I had spotted a pretty straightforward recipe from French Country Cooking that I've been wanting to try...I finally managed not to eat all the raspberries before getting a chance to use them in this recipe! 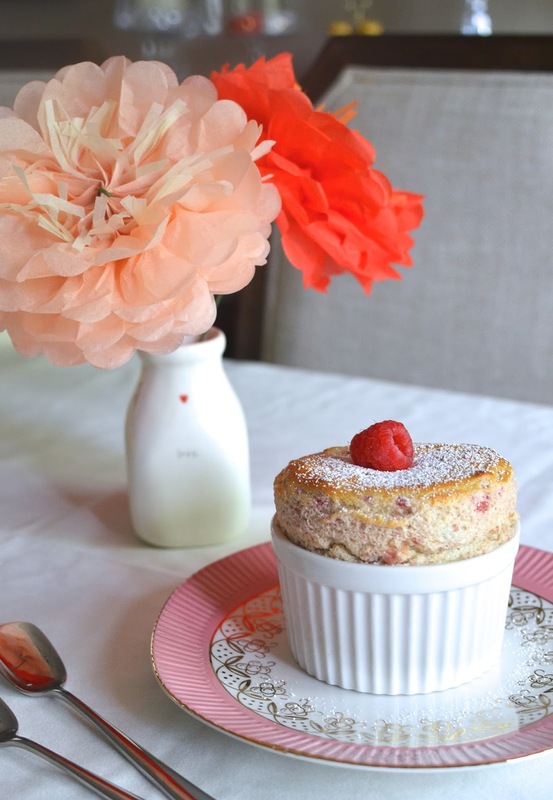 I can now tell you I'm really happy I tried this recipe because it worked very nicely and the result tasted light, sweet, airy - everything good about a glorious soufflé! And it wasn't difficult to make. 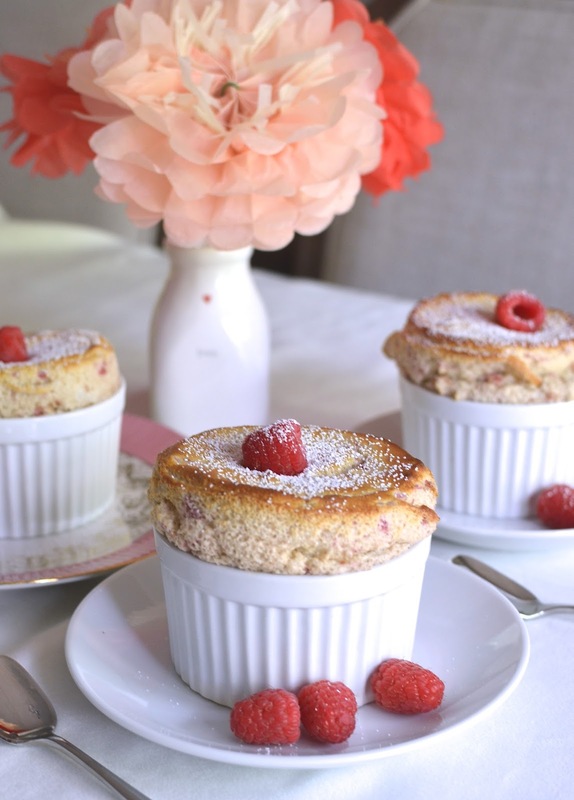 In this recipe, you simply crush the raspberries and whisk them into the soufflé base. In other words, there's no pureeing raspberries, cooking them down with lemon juice, then straining the mixture in order to make a raspberry syrup to start with that you often see in other recipes. In fairness, you won't end up with as even a pink hue as you would expect if you were to do that but I think it's a fair exchange for the ease here. While the raspberry soufflés were baking, the kitchen started smelling like cotton candy! I loved how they rose steadily in the oven and didn't split and spill overboard like they sometimes do. Of course, the very best part is that moment when you dig your spoon into the warm soufflé, and taste it...it's like a warm egg custard with a punch of sweet raspberry flavor. 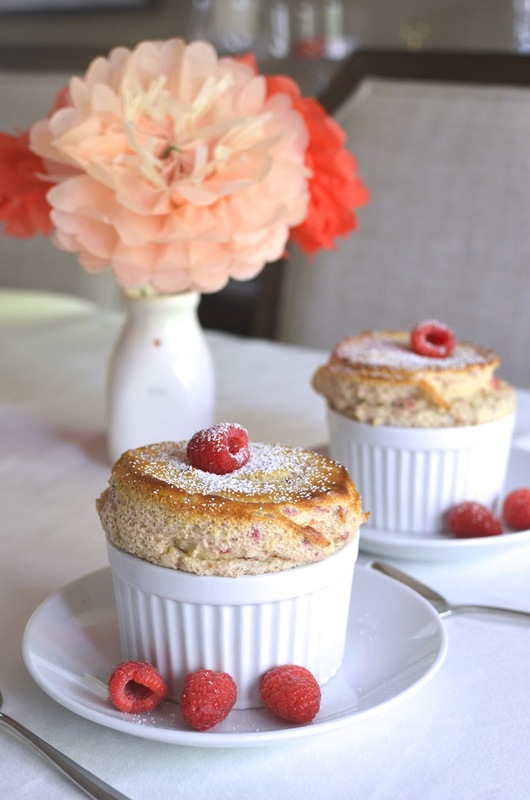 I think soufflés are always a treat and this raspberry version (that's not at all complicated to make) was no exception. While it's been a lot of fun talking about afternoon tea and making British-style biscuits, I'm stepping back onto home turf and talking cookies today - as in the soft and chewy, warm-from-the-oven, kind of chocolate chip cookies we love in America! Incidentally, the only instance where I ran into American-style cookies in London was from a shop called Ben's Cookies; the logo caught by eye (turns out, it was illustrated by Quentin Blake, well-known for illustrating Roald Dahl's books) and seeing the cookies made me a little nostalgic for home. And if the British have tea time, Americans have our coffee break and what better to go with a cup of coffee than a classic chocolate chip cookie (except maybe a brownie)? These cookies and some others from DisplacedHousewife caught my eye recently when I saw them on Instagram. They looked delicious and sounded so interesting, I was eager to try one as soon as possible. 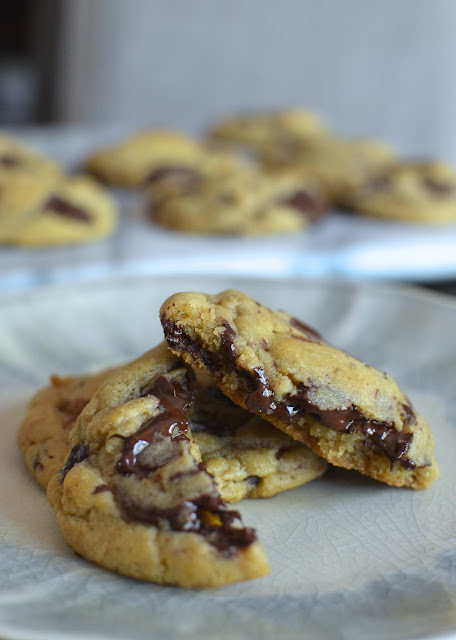 These are called "olive oil chocolate chip cookies" but they actually have both butter and olive oil in them. Visually, they reminded me of my favorite whole wheat chocolate chip cookies and made me think of Ovenly's vegan chocolate chip cookies. Not only that, they also have a mix of bread flour and all-purpose flour in them, making me think of Jacques Torres' much touted chocolate chip cookies. So as you can see, it had a lot of promising qualities going for it (and I wish there was some way to incorporate it all in the title of these cookies) and I was more than happy to give them a try. Let me tell you - I wasn't disappointed because these cookies have an amazing texture - incredibly chewy and soft yet firm, with a slight crispness at the exterior. Those are qualities I personally love in a chocolate chip cookie. When I first took the cookies out of the oven, I have to tell you that they looked great but they smelled rather fruity - from the olive oil. I'll be honest...I was concerned the flavor from the olive oil might be too strong for us, but it didn't turn out to be the case. Sure, you smell the fruitiness and I think it's discernible in the first bite but you really don't taste it thereafter. I'm thinking the olive oil + butter combination might be the best of both worlds...you get the chewy texture from the oil and flavor from the butter and a bit from using olive oil specifically, too. Next time I make these, I might be tempted to try it with a neutral-flavored oil but truly, the olive oil taste in the actual cookie is fairly mild. Let's not stop the tea party just yet...and extend it just a teensy bit longer, shall we? I need to put the little tea cups and china I bought on our recent trip to London to good use. So let's sit a spell and have another cup of tea. Nothing fancy, but we need something to nibble on. I know! 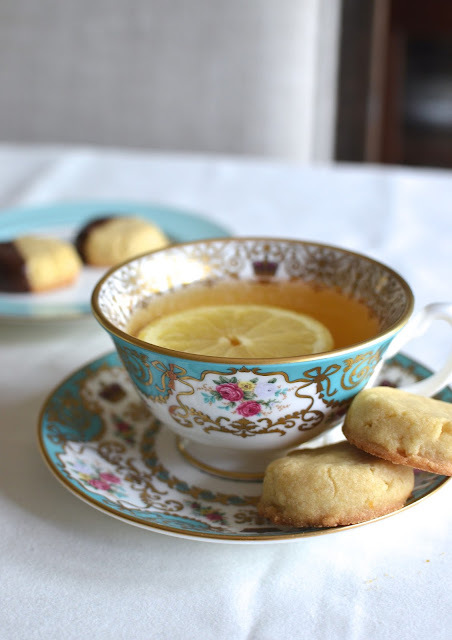 How about some lemon curd biscuits to go with our cuppa? Doesn't that sound good? A traditional crisp, buttery, British-style biscuit with a refreshing taste of lemon is just the thing to go with a cup of tea on a spring afternoon. After we braced the long lines and gawked at the crown jewels at the Tower of London, I bought a couple of souvenirs...the tea cup I'm using here and a little book full of recipes for afternoon tea. This biscuit recipe in that book called out to me because I adore lemon (and other citrus flavors in desserts) and these biscuits actually have a bit of homemade lemon curd stirred into the dough itself to give it a nice strong lemon flavor. The dough is a bit dry and I likely handled it a little more than I should have. I found these biscuits best eaten the day they're made and I really enjoyed the flavor of them...a lovely blend of sweet-and-tart from the lemon curd. The neat thing is you start the recipe by making a small batch of lemon curd. After using a portion of it for the biscuits, you end up with a little extra lemon curd as an added bonus! These lemon curd biscuits are great on their own. But you know me...I dipped some in chocolate. Absolutely not necessary but it's a near reflexive move that I can't control at times. Either way, with or without chocolate, it's just about taking a break and enjoying simple things. Even if it's a tea party for one sometimes, it's nice to take a moment to treat yourself. After the biscuits are made, you still have a small bonus amount of homemade lemon curd leftover. It's an excellent excuse to bake a fresh batch of (British-style) scones, which is just what I did! Maybe we have a renewed appreciation for British-style scones now because my family and I enjoyed these immensely over Sunday breakfast. Lemon curd is simply delicious with scones! 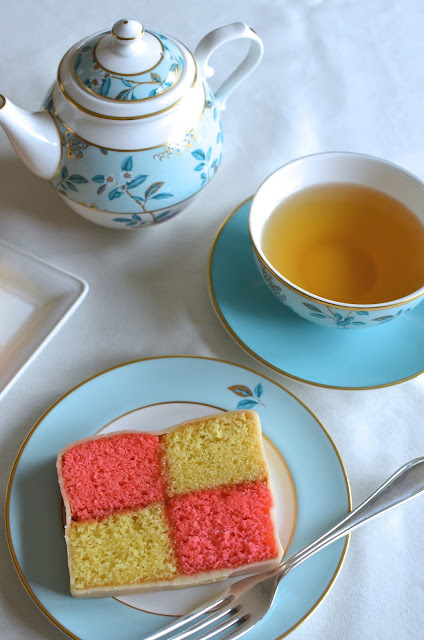 I'm back with a second inspiration from London: Battenberg cake! You've no doubt seen this cake before. There's a whimsical quality to it, with its alternating colors and checkerboard pattern. I know I've seen it and smiled, thinking maybe I'll give it a try one day but never quite finding the motivation to actually take action. Well, traveling and the desire to recreate good food that you had along the way is a great motivator. Battenberg cake is an almond sponge cake (though we're referring to British sponge cakes like the Victoria sponge, which are buttery batter cakes) fused together with apricot jam, and wrapped in marzipan. It was reportedly created in honor of the marriage of Princess Victoria to Prince Louis of Battenberg back in 1884. Being a classic British afternoon tea cake, it was one of the desserts we sampled during afternoon tea at Fortnum & Mason in London a few weeks ago (I ate a lot of delicious things there during that tea). The cake was one of several desserts we could choose from following the tiers of finger sandwiches, scones, and desserts we were served at the table; we were stuffed by the time it came to choose from the dessert trolley but somehow managed to make room for a few more bites, and I was pleasantly surprised by how tasty the Battenberg cake was. So that got me seriously thinking about trying my hand at making Battenberg cake at home. Surprisingly, the cake is not all that hard to make! You make one almond sponge cake batter, color half of it in pink, and bake both colors in one pan (using a makeshift divider). Once baked, it's a matter of slicing the cake into logs, fusing them together alternately with apricot jam, then rolling out marzipan and wrapping the cake in it. It's not just fun to look at, this cake tastes good as well! You have buttery almond sponge cake with the extra flavor and moisture from apricot jam that goes so well with it, wrapped in the sweetness of the marzipan, which also adds a lovely chewiness to the bite. It really is a great cake to enjoy with a cup of tea. And I can't help but think it would be a lovely bake for Mother's Day coming up! To be honest, I didn't think I'd find a lot of cooking inspiration that I could tackle at home from London and I'm glad I was wrong. I'm really happy I made this cake; I'm not sure I ever would have if not for tasting it on the trip. It felt great to be able to recreate it at home and I think my family was pretty happy with my efforts, too. It's wonderful to be able to extend your vacation and travels by reminiscing with food. And the only thing better than making something is watching it disappear quickly as everyone enthusiastically polishes it off!